During my visit to America I was introduced to a food that I didn’t realise existed. Just when I thought the United States couldn’t produce anything more ridiculously calorific I was introduced to…..
I’m serious. Cheese….on a stick. There are lots of foods that work well on a stick such as kebabs, ice lollies, marshmallows etc., but not cheese; unless it’s accompanied by a chunk of pineapple and poking out of a potato covered in foil at a 1980s buffet. But did it stop there? No. 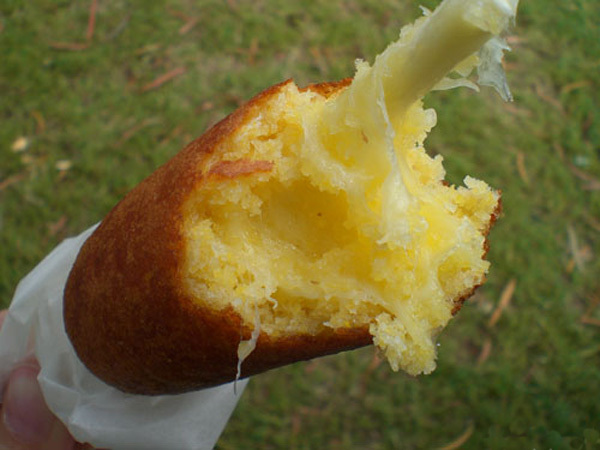 The Americans decided that ‘cheese on a stick’ should be dipped in batter and deep fried. Someone should warn these people before they get fat. Interestingly, as we walked out of the food court (and I use the word ‘food’ loosely), I saw a very overweight couple stood at ‘The Cajun Grill’ ordering, well, everything it seemed. The young guy behind the counter should’ve refused them service and said “No! Baaaad fatties!” and sprayed them with water. That would’ve confused them because no-one in the U.S. food industry uses the word “No” and fatties don’t recognise water. This entry was posted in Humour and tagged America, calories, cheese, deep fried, fat, fattie, stick by headinablender. Bookmark the permalink.